The orignal scan of this article is at: https://oregonnews.uoregon.edu/lccn/sn85033159/1909-02-13/ed-1/seq-3/. 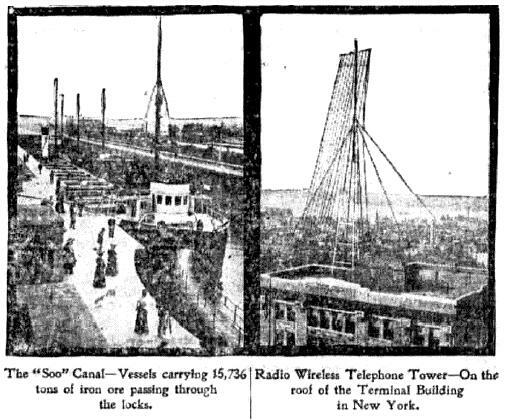 WIRELESS telephony, that latest, and in many ways greatest, wonder of this electrical age, is on the eve of working a complete revolution in the methods of handling the enormous shipping of the Great Lakes. Already, at scores of points along the lakes, the towering poles of the wireless telephone system, each with its antennae of wires, are being put in place so that by next Spring the system which already has made itself invaluable to the great Pacific fleet of our navy, as well as to the navies of Great Britain and Italy, will be in use from end to end of the chain of America's inland seas. By use of this system marine insurance rates will be reduced to a minimum, owing to the fact that all storm warnings may be transmitted immediately to lake vessels so that they will have ample time to make safe harbors and, used in conjunction with the enormous existing land system of wire telephones, will make it possible for persons either on the shores of the lakes or hundreds of miles away, to talk with officers or passengers on any of the vessels engaged in the lake trade. Without the enormous expense of wire maintenance that is necessary to the wire 'phone systems, and also without the expense of an expert operator as is necessary with wireless telegraph systems, the use of the wireless telephone will be within financial reach of the most modest sailing craft plying from port to port. Few persons, even those directly connected with commerce on the Great Lakes, realize the enormous interests represented in that trade; therefore few realize the vast boon conferred by the latest electrical marvel. Eighty per cent. of all the water tonnage of North America is carried on the Great Lakes. Thirty thousand craft of all classes today are engaged in the lake trade, and the lake shipyards are from one to three years behind on their orders from lake ship-owners. Although one-half of all the vessels built in the Western Hemisphere in 1908 were for the Great Lakes trade, the need for more bottoms has become so acute that steamship companies engaged in the trade recently have been obliged to go to English and Scotch shipyards with orders. The freight conveyed over these waters during 1908 was more than seven times as much as the whole world carried through the Suez Canal in the same time. Four thousand freight steamers, 250 big passenger steamers and about 25,000 pleasure and other craft comprise the enormous Great Lakes fleet, which uses upwards of three million tons of coal in a single year, or enough to heat every house in Chicago for three years. The Pittsburg Steamship Company, which is merely the carrier of the United Slates Steel Corporation, alone owns ships with a combined capacity of 650,000 tons of ore during a single trip. If the ships of this company alone were placed end to end they would cover distance of eight miles and during the eight months of Great Lakes navigation each year they carry as much freight from Lake Superior to Lake Erie ports as all the vessels of the world take through the Suez Canal in whole year. In weight of freight annually handled, Buffalo and Duluth are the world's greatest ports, while the tonnage handled at Ohio ports alone exceeds that of all the ports of France. During 1907 approximately 100,000,000 tons of freight were shipped in Great Lakes bottoms. This would be enough to fill 2,500,000 forty-ton freight cars, or a train that would girdle the earth and extend from New York to San Francisco in addition. More than 90 per cent of this immense total consisted of 37,513,600 tons of iron ore, 14,000,000 tons of coal, 110,598,927 bushels of grain, 1,159,757 tons of flour, 14,888,927 bushels of flaxseed and more than 1,000,000,000 feet of lumber. Greatest of all lines of lake traffic is that in iron ore, and some 800 giant steamers are engaged solely in its carriage. This ore commerce has doubled during the last six years and the steel men believe it will be doubled again during the next ten, for three little patches of the Great Lakes country produced in 1908 nearly half of the world's total supply of iron. During 1908 200,000,000 bushels of grain and 11,000,000 barrels of flour were shipped from Lake ports, the grain shipments from Port Arthur and Fort William alone being well over 80,000,000 bushels. At least 90,000,000 bushels of wheat, 60,000,000 bushels of other grain and 7,500,000 barrels of flour passed the "Soo" canals and 50,000,000 bushels of grain, conservatively represent the total shipments from Chicago, Milwaukee and other ports whose eastbound commerce does not pass through these canals. This year's lumber shipments aggregated nearly 1,500,000,000 feet, or enough to build more than 75,000 houses of eight rooms each. Taking the "Soo" canal as its center and drawing a circle having radius of 350 miles, it would be found to include four of the world's greatest ports, Buffalo, Cleveland, Chicago and Duluth. Within the circle or upon its circumference are such other ports as Detroit, Toronto, Dunkirk, Erie, Conneaut, Ashtabula, Lorain, Sandusky, Toledo, Gary, Milwaukee, Ashland, Superior and Port Arthur. The eight states along the Great Lakes are in reality the heart and power of the nation. Within their borders dwell 35,000,000 people and upon their shores center the greatest industries of the world. Should the lakes disappear suddenly the industrial supremacy of the United States would receive staggering blow from which it might never recover and more than half the population of the nation would be vitally affected. The steel industry would come to an untimely end. With all the great shipyards straining every effort to meet the demands of the lake commerce, shippers agree that they never will be quite able to meet the requirements of the traffic. Everywhere from Duluth to Buffalo the shipping is crowded, in many cases dangerously so. The greatest ocean ports never have known such blockades as Duluth has seen on more than one occasion. During one month alone last year there were 1,221 arrivals and clearances at this port, an average of forty a day. Steamers pass through the Detroit River on an average of one every twelve minutes, night and day. Harbors and canals must be enlarged to facilitate the growing business and unless there is some means available for the protection of this vast shipping, the tragedies of this next decade will be greater than those of all the past. In the wireless telephone it is believed that protection has been found. The Great Lakes are known as the most treacherous highway in the world. Great storms, coming up at a few hours notice, do enormous damage to shipping. Scores of vessels suddenly and mysteriously disappear each year, leaving no trace behind them. According to the records more than $15,000,000 worth of freight has been lost on the lakes, involving the wrecking of 14,000 vessels and the total loss of more than 2,000 ships. During the last thirty years, in which time the records have been practically complete, the wrecked vessels numbered some 8,000, nearly 1,000 of which were total losses, while the loss in cargoes alone has exceeded $12,000,000 in this same period. A notable case in point occurred in 1906 when the steamer "Flagg" went down with cargo of metal worth $1,250,000, none of which ever has been recovered. One of the most horrible disasters in the whole history of the Great Lakes was the wrecking of the "Griffin" and her destruction near Cleveland, involving the loss of 280 lives. Thousands of other tragedies mark the history of the treachery of Great Lakes storms. During the first week of October, 1908, a round dozen ships, valued approximately at $500,000 each, were wrecked during a severe storm. The net losses during this week were not far from $1,000,000. Warnings of the storm that caused this damage were posted by the United States Weather Bureau eight hours in advance and, had the lake vessels been equipped with wireless telephone apparatus at the time, every one would have had ample opportunity to have made port or safe harbor. As it was, they had no warning of impending danger. Another great peril to lake shipping is that of collision and conditions in this respect grow worse from day to day. During the whole eight months of the shipping season each year, scarcely a day passes without one or more collisions. These conditions, which of course are especially acute in time of fog, could be almost entirely obviated by wireless telephonic communication from ship to ship and, as all the dangers which surround the shipping interests on the lakes naturally compel the exaction of excessive insurance rates, this in turn reacts upon the freight tariffs so that the overcoming of the perils from storm and collision means material reduction in cost of present lake transportation which, in spite of every existing obstacle, is exceptionally low. It is an admitted fact that the Great Lakes constitute the nation's chief safeguard against oppressive railroad rates. They are the regulators of our great commerce and the traffic on the lakes saves to the people of the United States $500,000,000 annually, or $6 for every man, woman and child of our population. Transportation over the lake waters in modern steamships costs from one-fifteenth to one-quarter of the prevailing railroad rates. It costs only two cents per bushel to ship grain from Duluth to Buffalo and only eighty cents to carry a ton of ore between these two points. This is exactly one-seventh the cost of railroad transportation for the same commodities between the same ports. In passenger rates nearly like difference is shown. During the season of 1908 the splendid passenger service of the Great Lakes was used by more than 16,000,000 people and the ratio of increase indicates this total will be doubled in less than a decade. The railroad fare between Detroit and Buffalo is $7, but by steamer one can travel the 900 miles between these ports for $2.50, while one day each week a fare of $1.25 prevails. The future of the Great Lake commerce is something so vast that none but the most venturesome would chance prophecy. With the great Mississippi system to the southwest, soon to be connected with Lake Michigan by way of the ship canal which Chicago is building into the Illinois River, vessels will be enabled shortly to pass from the Great Lakes down the Mississippi to the Gulf. To the northwest lies the great wheat country of central North America, the focal point of which is the growing city of Winnipeg, located at the junction of the Assiniboine, now navigated for 300 miles, and the Red River of the North, up which steamers can go to the Minnesota, through the great wheat fields of the United States, thus bringing her sphere of influence south to Grand Forks and Fargo in the Dakotas. Lake Winnipeg, which is as large as Lake Erie, now is being connected by locks with the Saskatchewan River system, navigable for nearly 1,000 miles into the very heart of the world's greatest grain fields. Soon this great inland water system, centering in Winnipeg, will have an outlet into Lake Superior by means of canal running through the Winnipeg River, already navigable for 200 miles; Lake-of-the-Woods, Rainy River, Rainy Lake, Nemekan Lake, Loon Lake, Nequokan Lake and others, requiring only a few miles of actual canal building to bring down to Thunder Bay the product of region which already is becoming the world's granary, although the Canadian grain trade is but in its infancy. The congestion in the Detroit Oliver is to be relieved by two Canadian projects giving free outlet over British soil to the shipping of the great Northwest. The first of these, the Georgian Bay project, is to take in the French River, Lake Nipissing and the Ottawa River, thus connecting Lake Huron with the St. Lawrence at Montreal. The second, the Trent Navigation project, now is open from Lake Simcoe to the head of Halley's Tails, a distance of 135 miles. Nearly all the unfinished portion is under contract. In few years the movement of ore to feed the hungry furnaces of Pittsburg will be by an all-water route, as a canal from Ashtabula to the great city of iron and steel will do the work of fifteen railroads at the cost of one. Today the Great Lakes hold the key to the commercial supremacy of America. Great capitalists, of course, are vitally interested in the traffic but most of the shipping on the Lakes belongs to the masses, the stock in the owning companies being held by hundreds of thousands. As the shares are among the most profitable and the safest investments in the world they have become the property of small investors such as farmers, mechanics and clerks and it is an interesting fact that one-third of the farmers in the lake counties of Ohio have money invested in lake shipping. Of all the needs of Great Lakes ships and shippers the greatest is for an adequate and reliable means of communication from ship to ship and from ship to shore. It is to meet this demand that hundreds of artisans and mechanics now are engaged in the construction of wireless telephone stations along the shores of the Lakes and installing instruments on the Lake vessels. No sooner had the wireless telephone become a commercial practicability, through the perfected inventions of Dr. Lee de Forest, who previously had won distinction on the wireless telegraph field, than its adaptation became matter of greatest concern to the shipping interests of the lakes. When the De Forest system was installed and successfully tested by the United States Navy with the result that Admiral Evans was able to be in constant vocal communication with all the officers and ships of the great Pacific fleet on its cruise from Hampton Roads through the Straits of Magellan and thence to San Francisco, there came insistent demands for an adequate telephone system for the lakes. Although the American Navy was the first to utilize wireless telephony, it since has been installed on many of the ships of the Italian Navy, while the navy of Great Britain is following the same course with all possible speed. What Wireless Telephony Has Done. Already, from the station which the De Forest people installed at the top of the Eiffel Tower in Paris, tests have been made which carried the human voice clear and distinct to beyond Marseilles, 600 miles away. In this country successful tests have been made for a distance of 150 miles, but when the new station is completed in the fifty-second story of the huge Metropolitan Life campanile in this city, it is confidently expected by the wireless telephone experts that they can project the voice much further than at the Paris tests. In fact, the inventor, de Forest, has declared that within short time he will be able to send messages between these two greatest stations so that the voice spoken in New York may be distinctly and immediately heard in Paris. When one considers that thirty years ago the present wire telephone system was laughed at as being nothing more than clever toy, and that Prof. Alexander Graham Bell nearly wore his heart and soul out trying to get the small sum of money needed to construct his small test line for three miles from Boston to Somerville, the suggestion of wireless talking from New York to Paris is not to be considered as smile-provoking proposition. 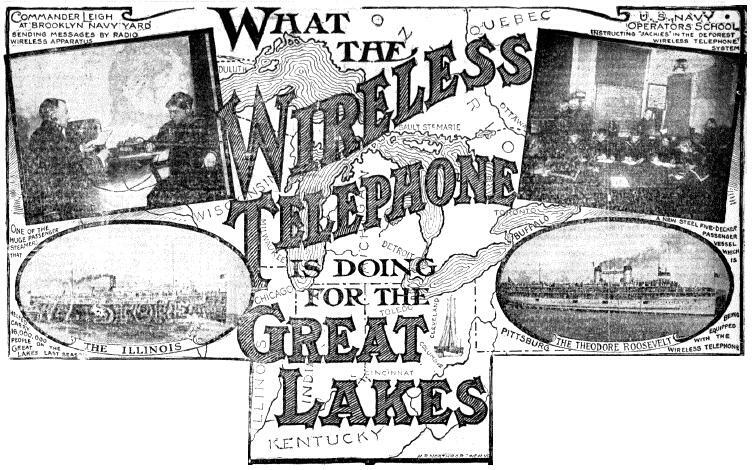 In establishing its system of wireless telephony it already has been announced by the Great Lakes Radio Telephone Company, of Cleveland, which controls the De Forest system for the territory in question, that it will work in conjunction with all the existing wire telephone systems, whether Bell or independent. By a simple contrivance the wire 'phone system can be connected with the wireless system at any of the latter's central stations so that person located at regular long distance telephone in New York, for instance, can be connected through the wireless station at Cleveland and hold conversations with a business associate traveling as a passenger on a steamer out in the middle of Lake Erie. Each central wireless station will have its apparatus attuned to certain number of vibrations on the principle of a tuning fork. The attuning of an instrument can be changed by switch, just as the switchboard of central wire station can be regulated by the insertion of plugs. In this way when a Lake steamer, for instance, desires to talk with Cleveland, its operator will throw the switch to the number of vibrations called for by Cleveland. When the wire instrument on the steamer is in repose, it will drop back to certain specific number of vibrations so that it can be reached by any central station calling its number, or, by means of an Aerophone automatic signalling device, can be reached by any station sending out storm signals in darkness or fog. In this way each instrument can be so regulated that it can either take up general calls from any direction or only specific calls for its own number, as might be desired. One of the advantages of the wireless telephone is that it does not require a franchise right to operate or right of way from any government, state or municipality. It talks through the air and is the only known method of vocal inter-ship communication or of talking from ship to shore. In case of fog or storm the sound of the human voice, projected by this means, is as clear and distinct as at any other time, and the invention is therefore peculiarly adapted for safety signals and life-saving service. A distinct advantage of the wireless 'phone over the wire 'phone is that the buzz of the wire always is absent. As any ship's officer can talk by wireless 'phone as readily as by wire 'phone on shore, all expense of an expert operator is eliminated and the apparatus is placed within the reach of the most modest boat afloat. The antennae wires of the apparatus are strung to the masthead of the ship by means of hempen rope, and are braced apart by a needle or spar of wood. The wireless telephone, just as the wireless telegraph, depends upon the projection of electric waves that pass through the atmosphere, and solid substances as well, with the velocity of light, which is 180,000 miles second or more than seven times the circumference of the globe. The mechanical principles upon which the wireless telephone depend seem to be simple enough, although there is a great difference of opinion as to the actual explanation of the phenomena of wireless telephony. Speech is the formation of very rapid complex and ever-varying series of vibrations of the air and their measurement by the nerves of the ear. Owing to the resistance of the atmosphere, these vibrations grow weaker and at last disappear as we get further from the source of disturbance. Telephony is the art of translating these vibrations of the air into vibrations of ether whose lesser resistance enables them to be carried to great distances for translation into air vibrations again, as only the air vibrations can be measured by the ear. In the wireless telephone the air waves are translated into the vibration of an electrical discharge which oscillates the ether. One exceptionally valuable feature of the wireless telephone, which the United States Government is utilizing as rapidly as possible, is its adaptability to the lighthouse and lightship service. Because of the absence of wire maintenance charges, it costs no more to talk from shore to lighthouse or lightship than it would cost to talk between two blocks of congested city district, and the lighthouse keeper or lightship people need have no expert training in order to operate the apparatus. At every turn the Government has shown its appreciation of he invention, which, in addition to having been installed on the thirty odd battleships, cruisers and torpedo-boat destroyers of the Pacific fleet before they started on their voyage around world, has also been installed at Fortress Monroe, Mare Island and other army posts. Still another feature of the invention, or rather the benefit that may be derived from it, is for the supplying of music and other forms of entertainment to passengers traveling on the passenger vessels. A service of this kind, aided by a huge receiver so that all of passengers gathered in large salon could hear the music or operatic airs simultaneously, should prove a most welcome innovation for steamship travelers. It is within the range of possibilities, at an early date, that the traveler by Great Lakes steamer may be able to spend his evenings listening to the voices of Caruso or Melba simultaneously with the audiences who see the singers in person at Covent Garden, London, or the Metropolitan or Manhattan Opera Houses in New York. With the first great long distance wireless station nearing completion at Toledo, with twenty-five other long distance stations already contracted for construction along the lake front, with work going ahead on seventy-five smaller shore stations and with fifty odd more already projected, there is reason to expect that, by the time Great Lakes navigation opens in the Spring for the season of 1909, the wireless telephone system will be in full operation on the Great Lakes with nearly 200 stations in use. The central station of the system will be located at Sault Ste. Marie, contract for its construction already having been let. Chicago, Cleveland, Detroit, Milwaukee, Duluth, Buffalo, Erie and Pittsburg are among the cities being provided with long-distance stations, while among other places for which minor stations are either planned or under construction are Sandusky, Lorain, Benton Harbor, Muskegon, Bay City, Cheboygan Manistee, Mackinaw, Alpena, Port Huron, Ashland, Dunkirk, Superior, Eagle River, Marquette, Escanaba Bay, Menominee, Marinette, Green Bay, Sheboygan, Racine, Kenosha, Waukegan, Gary, Grand Haven, Traverse City, Petoskey, St. Ignace, Grand Rapids, Ashtabula, Charlotte, Oswego and Sacketts' Harbor.